The Syrah grapes for this wine were hand selected from three oldest blocks of lower yielding vines on a slope with red clay and good drainage. The grapes were hand harvested in the cool mornings of February at 24-25°Brix and hand sorted which resulted in grapes with optimum ripeness, with full flavors and tannins. The Syrah was vinified with a long maceration period to get the full flavor and complexity. The Orient was aged in new and second year French and American oak barrels for twelve months for well-structured tannins and integration of oak characters. As our vines mature in the vineyard, The Orient Syrah becomes fuller in body and more robust with layers of dark cherries, chocolate and spices. The palate shows ripe plums and black currant with complex, dry and generous mouthfeel with rich fruit, young yet refined tannins. Held together by balanced acidity and the long, sweet and toasty hints of coffee and cedar. 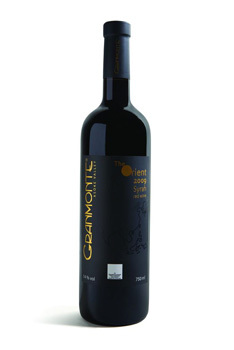 It is robust with integrated vanilla oak, powerful tannins and long lingering finish. This wine is pleasurable drinking on its own or with food. The Orient Syrah is crafted to be enjoyed with a few years of cellaring and will improve with age. Drink now – 2025.